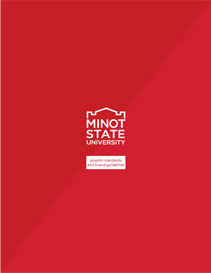 The Graphic Standards Manual provides guidelines to help ensure consistent application of the Minot State University identity. Projecting a unified visual identity involves more than simply creating and implementing a logo. Graphic standards provide a sound, flexible structure for using logos, color, and typography — a graphic "vocabulary" unique to Minot State. Because the first contact one has with Minot State is often through printed and online communications, it is vitally important that graphic and brand standards be followed closely. By consistently following these graphic standards, Minot State’s visual identity will become established and recognized. These elements will work together to give all Minot State University communications a unique and cohesive appearance. Failure to properly use these elements reduces our ability to communicate with the school’s many audiences, and diminishes the identity’s value.